In part III of our three part series of posts providing information on metal plating, we will take a look at future predictions regarding the metal plating industry. In particular we will look at (1) Global growth, (2) New developments, and (3) Future strategies. We hope this information will be helpful to other electroplating companies as well as individuals researching this field. This graph follows growth patterns from 2013 to 2020. Our data is provided by Global Industry Analysts, Inc. Electronics, automobiles, and aircraft are constantly being manufactured and improved on with today’s fast growing technology, in addition this causes higher demand for industrial manufactures. 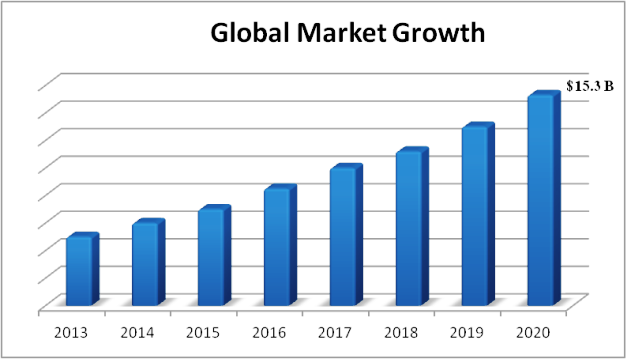 From this graph, global demand for electroplating will surpass $15 billion by 2020. However, keep in mind, part of these projections will rely on continued growth in the Asia-Pacific, which is currently in an economic crisis. New developments throughout the metal plating industry will also have a major effect on future growth. In general, these new developments will be tied to improvements to technology. First, existing technologies will certainly be improved upon. Optimization will include improved process monitoring and control systems, manufacturing, and energy efficiency. Secondly, new technologies will also come into play as the industry evolves. Some new technologies will include new alloys, greener and more efficient plating processes, and possible developments in nanotechnology. It’s not surprising there will be changes in strategy as time goes on, most of all, improvements to automation and technology will dominate the industry and bring electroplating into a new era. Due to these changes, there may be reductions to cost while still providing quality products (maybe even better quality). In addition, we may also see a shift to greener, safer plating processes. Finally, we may also see more alliances between manufactures in an attempt to remain competitive. American Plating Company will continue to research topics in our field in order to provide helpful insight to our peers and those interested in the metal plating industry as a whole. For more information, see our blog or give us a call at: (314) 776-0542.